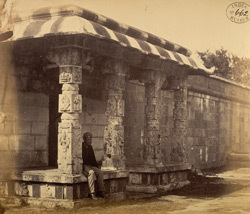 Photograph of the porch of the mandapa of the Kailasanatha Temple at Taramangalam, Tamil Nadu, taken by the Madras School of Industrial Arts in c.1868, from the Archaeological Survey of India Collections. This temple bears inscriptions from the Hoysala, Pandya and Vijayanagar periods. Part of the temple existed as early as 1260 but the majority was built in the first half of the 17th century. The temple consists of many enclosures or prakarams, entered through a pyramidal five tiered gopura, or gateway, covered with stucco figures of the various divinities. The temple is renowned for the remarkable sculptures from the epic of the Ramayana and the figures of tortoise, fish, monkeys and crocodiles carved on the walls and the granite roofs. The outer pillars of the mandapa are carved in high relief with rearing horses and riders and yalis. This view shows a porch with four elaborately carved columns and a overhanging eave.